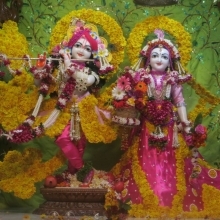 HH Lokanath Swami was born in 1949 in the village of Aravade in Maharashtra, India. 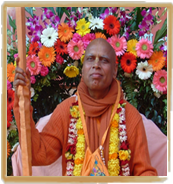 He became an initiated disciple of Srila Prabhupada in 1972. He then received Sannyasa from His Divine Grace in December 1975, at the age of 26 years. Srila Prabhupada ordered him to preach Lord Caitanya’s message by organizing Padayatra (walking festival) worldwide. The first leg of the journey was from Vrndavan to Mayapur. In the course of his padayatra service, His Holiness travelled by foot to many of the major tirthas and sacred sites of India. As the ISKCON minister for the Srila Prabhupada Centennial, His Holiness co-ordinated a global campaign. In 1996, the magnificent Centennial celebrations achieved unprecedented success in terms of the number of Srila Prabhupada’s books distributed, plates of prasadam served, and festivals conducted worldwide.